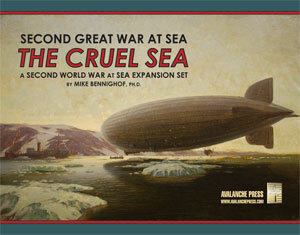 Second Great War at Sea: The Cruel Sea is a massive expansion set for Bismarck and Arctic Convoy, pitting the German High Seas Fleet against the French and Russians in a war that never actually happened. In our Second Great War alternative history, the First World War ended in late 1916 with Woodrow Wilson brokering a negotiated peace that left the great empires intact. War returns in 1940, with France, Italy, Russia and some minor allies assaulting the Central Powers of Imperial Germany, Austria-Hungary and Ottoman Turkey. Far more than in our own history, France has poured resources into her armed forces in preparation for the Jour de Vengeance when the lost provinces will finally be returned and the humiliation of Wilson’s Peace avenged. That includes a powerful fleet centered around re-conditioned dreadnoughts of the First Great War era and new fast battleships built to innovative designs. Let’s have a look at them. France came fairly late to the Dreadnought Age; a large class of semi-dreadnoughts had been laid down at about the same time as Britain’s revolutionary all-big-gun battleship. With the British having taken responsibility for France’s Atlantic naval defenses, French battleship building paused. They laid down two units of the Courbet class in 1910, and two more in 1911, armed with a dozen 12-inch (305mm) guns, four of those in inefficient “wing” turrets. In contrast, the British had already moved to the 13.5-inch gun a year earlier, with all of them mounted along the centerline and able to fire on either broadside. In our own reality, the Marine Nationale did little to modernize the class after the Great War. One of them (France) was wrecked during a storm in 1922; the other three had little combat potential by 1939. In our Second Great War story arc, they’ve been heavily rebuilt during the 1930’s. 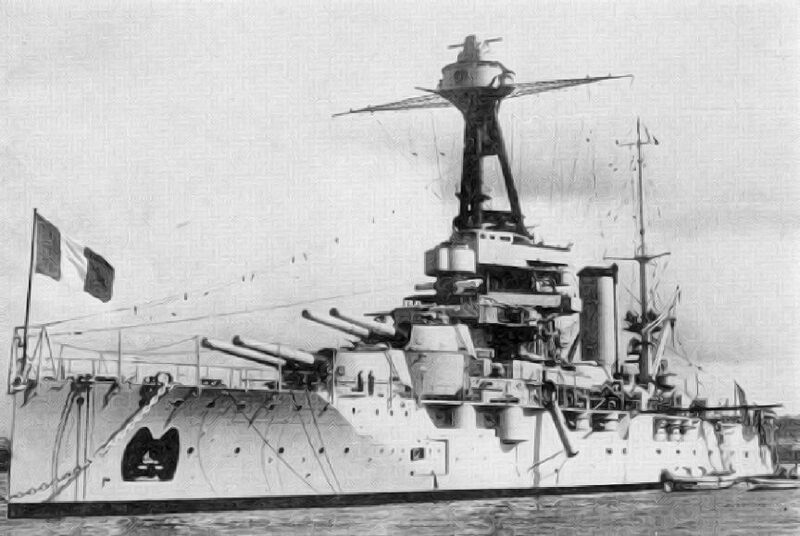 The wing turrets have given way to a pair of triple turrets for six-inch guns, the same mounts found on the new fast battleships. That leaves a main armament of eight 12-inch guns, their elevation increased to improve their range. The huge array of 22 5.4-inch guns in casemates had never proved very effective – some were mounted directly below the main guns, subjecting the crews to blast effects, and others shipped water in even relatively calm seas. All would be removed during modernization, to be replaced with eight 3.9-inch dual purpose guns in four twin mounts, the same as fitted in the new Richelieu-class fast battleships. The torpedo tubes would also be removed. As with other old battleships, the coal-fired boilers would have to be replaced by new oil-burning machinery, raising their horsepower output but probably at best keeping their speed of 21 knots intact thanks to the age of their hulls and inner structure. They would remain fairly slow ships, unsuitable for deployment with the fast battleships. That inner structure would prove a serious impediment to modernization. Though classed as dreadnoughts thanks to their all-big-gun armament and turbine propulsion, the Courbet class had been armored along the same principles as the preceding classes of semi-dreadnoughts. Armor protection by weight matched that of other navies’ dreadnoughts, but it had been spread over a much larger area, including deep below the waterline. The designers had been concerned about underwater shell hits, and the Courbet class would indeed face such a hit with armor – which the shell would then likely penetrate thanks to its relative thinness. While the belt armor and deck armor could be thickened, and additional protection provided to the main gun turrets, little could be done to remedy this fundamental design flaw. Océan as a stationary training ship at Toulon, 1939. During the actual Second World War, Courbet and Paris shelled advancing German troops during the 1940 campaign, but saw no further action – Courbet eventually became part of an artificial breakwater during the 1944 landings, while Paris became a barracks for Polish sailors in Britain. Océan had been relegated to stationary training duties before the war began and became a German target ship. As modernized for the Second Great War, they’re no match for the oldest German modernized dreadnoughts and suitable only for secondary duties at best. They don’t fare well in our story. For their next class of dreadnoughts, the Marine Nationale repeated most of the flaws of the Courbet class, with bigger guns. The Bretagne class carried ten 13.4-inch (340mm) guns in five twin turrets, with a centerline turret amidships replacing the two wing turrets of the previous design. Otherwise the new ship carried over the same hull, with similar machinery and the same outdated armor scheme. They had slightly better underwater protection, as the removal of the wing turrets allowed fitting of an armored bulkhead. With the French Army preparing to extend conscription from two years to three, thus increasing the size of its regular forces, the Marine Nationale lost out in the 1912 military budget and only three dreadnoughts were authorized rather than the four desired. They commissioned during the Great War, two of them in 1915 and the third a year later. More extensive work came in the mid-1930’s, with the useless side armor removed at either end of the ship and new armored bulkheads fitted instead to improve water-tightness. The 22 5.4-inch guns were reduced to 14, new 3.9-inch dual-purpose batteries fitted, and the old boilers fully replaced with new oil-fired models. In one ship, Lorraine, the amidships turret was removed and replaced with a hangar and catapult allowing her to operate four seaplanes. Provence shortly before the outbreak of war. We’ve taken that somewhat further in The Cruel Sea, giving all three the full reconstruction similar to Lorraine’s with a larger seaplane hangar than that fitted to Lorraine (so they can rate two scout planes) and removing all of their secondary guns, replacing them with more 3.9-inch twin mounts. None of them proved very useful during the actual Second World War. Bretagne exploded under British fire at Mers-el-Kebir, killing nearly 1,000 of her crew. Provence sank there as well, but would later be salvaged and transferred to Toulon where she was scuttled in November 1942. Lorraine served the Free French cause and bombarded coastal targets in 1944 and 1945 before serving a few years as a training ship after the war. Even with extensive modernization, the three ships aren’t useful for much more than bombardment duties, but in the Second Great War story they sally forth to help protect French commerce. It doesn’t end well. That’s not the case for the modern French battleships. We’ll look at them in our next installment.